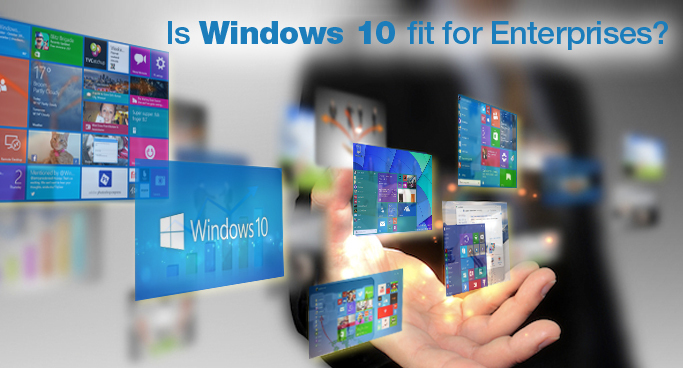 Is Windows 10 fit for Enterprises? Windows 8 and its later upgrade 8.1 failed to impress business and enterprise users. Many enterprise users decided to stick with Windows XP or upgrade to Windows 7 instead of Windows 8. Many issues were left unaddressed in Windows 8; it was criticized for being complex and for not bringing any major changes to meet business needs. With the launch of Windows 10, Microsoft has promised; it to be the “best enterprise platform ever”. So the question is will Windows 10 receive the same reception from enterprises that it had received for Windows 8 or will Microsoft be able to convince its enterprise users to upgrade to Windows 10? With Windows 10, Microsoft has launched a set of new features to address the concerns enterprises had with Windows 8 and is making continuous efforts to win the confidence of the enterprise customers again. Let’s look at the enterprise-specific features of Windows 10 to determine whether it is fit for enterprises or not. Smartphones and Cloud technology have enabled the employees to work while being on-the-move. Taking this into consideration, Microsoft has introduced Windows 10, which is a unified operating system that can run across various devices, be it desktop, laptop, tablet or smartphone. With Windows 8 Microsoft had tried to create a single interface, but the interface that worked on touch screens did not work well on desktops. But in Windows 10, there is only one unified OS that can adapt to desktops as well as touch screen interfaces. The live tile interface in Windows 10 provides a touch screen interface when installed on a tablet or smartphone. Thus employees can have Windows 10 on their desktops and run the same on their smartphones or tablets simultaneously. Microsoft has said that this feature will give employees using smartphones, a fast, fluid and familiar experience that seamlessly interacts with their desktops. Windows 8 had introduced Metro-style user interface, which was unappreciated by enterprises due to requirement of training as users had experience in working with the old interface. Windows 10 has brought back the start menu of the older versions of Windows by including Live Tiles of Windows 8, which gives a similar look as the popular Windows 7 release. This has removed the training needs for Windows 10 OS to learn simple tasks. Windows 10 provides a universal app platform to developers, where they can build apps for one platform and users will be able to access them on all Windows 10 devices including desktop, laptop, notebook, phablet, tablet, smartphone or even a server. This will make enterprises to deploy these apps across the entire organization like apps for Calendar, Microsoft office, mail and more. These apps might not be useful to all the employees in an enterprise, but having a single app for all Windows platforms will definitely be helpful to large businesses to lower their training costs, support costs including app license costs. Due to wide use of Microsoft Office in the enterprises, Windows 10 will have touch-friendly version of Microsoft Office apps. The universal office apps including Word, Excel, PowerPoint, OneNote and Outlook are optimized for touch and phone use, allowing employees to work on the go. Microsoft Office apps are specially built to bring a consistent look and feel across all Windows 10 platforms. The app will have the Office Ribbon just like desktop version to help employees’ access different menus. There will not be a separate store for Windows and Windows Phone in case of Windows 10. This feature has been incorporated to bring the app store concept to the enterprises where employees will be able to make single as well as volume purchases. The main advantage for the enterprises will be that they will be able to control the applications, an employee can see on the store. Windows 8 allows to side-load the apps but Windows 10 will provide a much enhanced experience to the enterprise users. Earlier Microsoft had Active Directory and Group Policy-based management capabilities for desktop and laptop, whereas modern and streamlined Mobile Device Management (MDM) capabilities for Phone and tablets. For the first time, Windows 10 will allow you to choose between Active Directory/Group Policy model and Mobile Device Management on any Windows 10 device. This approach has been introduced to lay emphasis on mobility, adding MDM options for the devices used by enterprises. The new added capabilities in Microsoft’s MDM stack will allow enterprises to manage multiple users sharing a single device including allowing control over user’s ID, data and apps along with the device and give full control over the Windows Store and configuration of Enterprise Data Protection policies. Security is the most important concern for every enterprise. Windows 10 is getting enhanced security to protect enterprise users from phishing and hacking. Users will have to give their identity to get access to devices as well as websites. There will be two-factor authentication in Windows 10, which will require users to login through password and PIN or through some form of biometric data (such as a fingerprint), without any requirement of external device. Windows 10 will also support separating a user’s business and personal data, so that enterprises can safely remove data remotely without deleting an employee’s personal data. Windows BitLocker has also been upgraded to provide portable protection for files that are moved from desktop or smartphones to another PC, device, email and even cloud storage. Another important concern that enterprises had was to determine the quantity and frequency of releases given by Microsoft unless a management server was not used. Large enterprises could control the frequency as well as the updates to be installed through Windows Server Update Services (WSUS), which small businesses failed to do. Windows 10 will now allow businesses to choose how their users’ desktops and devices are updated. They can opt for Microsoft’s updates schedule or manage their schedule themselves. They can even choose to mix and match, by differentiating the users and providing updates as and when necessary.This new functionality has specially been introduced for small enterprises that don’t have the resources and ability to run WSUS. Windows 10 will allow adding Azure Active Directory to increase security, giving users a secure access to their applications on any Windows 10 platform. Microsoft has also ensured that users will be able to log into Windows with Azure Active Directory (AD) account. Windows 10 will handle both Windows AD and Azure AD together to help users log into cloud applications as well as Windows simultaneously. This will help the users to login to any of them through one ID and password, with no requirement of remembering different login credentials. There are always risks involved in upgrading to newer Windows versions due to unreliability and end user concerns, which makes enterprises avoid upgrading to new OS. Windows 10 has improved the upgrade process by ensuring that the existing management infrastructure will be preserved and end users’ experience will not be affected. There will be in-place upgrades without the requirement of removing older OS to install Windows 10. All the apps, data and configurations will be preserved even after moving to Windows 10, making it easy for enterprise users to continue working on their documents. From the above points it can be concluded that Microsoft has definitely considered the needs of an enterprise, addressing the concerns they had with Windows 8. Microsoft is making real efforts to win back the confidence enterprises had placed on Windows. Windows 10 certainly looks to be a better and powerful operating system for enterprises. Though the final product is yet to reach the market, Microsoft seems to be on the right track!! Windows 10 is expected to get officially released later this year, which gives Microsoft much time to mould Windows 10 into a reliable, robust and intuitive operating system that enterprises are expecting!! Semaphore Software is a leading IT solutions provider, offering end-to-end Windows App Development Services across the globe. You can hire our dedicated and professional developers, having extensive experience in providing high-quality solutions and services. Feel free to contact us through info@semaphore-software.com for your development needs! !